If you have landed in the UAE, you are definitely in for the ultimate desert experience! While there are lots of adventurous experiences that the desert has to offer, you just can't miss the roller coaster ride across sands a.k.a. dune bashing! No trip is complete without the crazy experience of sailing through heaps of sand and flying up into the air as you bash against the golden dunes. You will never forget your emotions as you set off from atop a dune and lash through the steep, unstable, spine-chilling slides of sands. Take note that this is not meant for the weak-hearted. In fact, be prepared for a wild adrenaline rush as you struggle to stay in control. 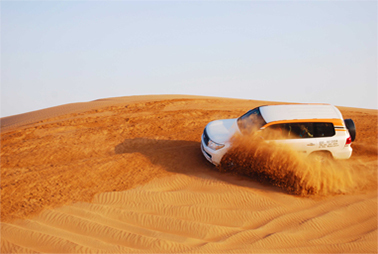 Professional drivers will take you for the wildest rides in the desert, where you'll get to experience the turbulence. You will certainly be stunned by the skills of the drivers as your heart misses a beat and you dwindle between fright and excitement every second. Crashing over dunes and wheels spinning out of high-speed dips on shifting sands will compel you to hold on to your life! You will experience the split-second change in atmosphere as the car hits high-speed and transforms into a roller coaster searing through the magnificent wilderness of the desert. Most tour companies offer dune bashing as part of their desert safari in Dubai options. Do put on your seat belt as dune bashing can be dangerous. Do make sure that your children's seat belts are securely tightened. Do go only with professionally trained drivers as it requires a lot of skill to maneuvre through soft sand at high speed. Do wear light clothes and comfortable shoes. Do not eat too much before a ride, you can easily get sick. Do not drink too much on the ride, you may throw up. Do not unnecessarily encourage the driver to go wild and show stunts. Do not continue dune bashing if you feel nauseous, dizzy, or frightened. Do not do dune bashing with very young children or elderly people with back problems. If you're interested in the whole package including dune bashing, you can pick between the evening or overnight safari trips. However, if you want to go exclusively for the thrill of dune bashing, the morning desert safari in Dubai is your choice. Book your trip online or call the 24-hour reservation hotline.